As I was staying at the Ramada Plaza Menam Riverside in Bangkok, the Asiatique was a short walk away. I spent two nights walking around the place and I quite liked it. This was my second stay at Ramada Plaza but I could not go to The Asiatique on the first visit. On that trip we could come back quite late at night and simply go and crash. 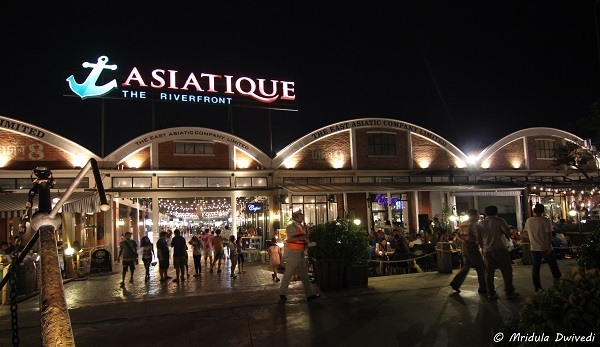 The Asiatique is open from 5.00 pm to 12 .00 midnight. As I was there at Songkran, the water festival was in full flow around Asiatique. But people don’t splash water in the malls so my camera and I was safe inside Asiatique. For me the prime attraction was the Asiatique Sky, the giant wheel which completely dominates the skyline. The ticket cost is 300 baht which is roughly 600 rupees. I went for a spin and I had the whole cabin to myself. Happy to go for a Spin! It was the standard procedure to give the camera to the cabin attendant for a picture. I too happily posed. 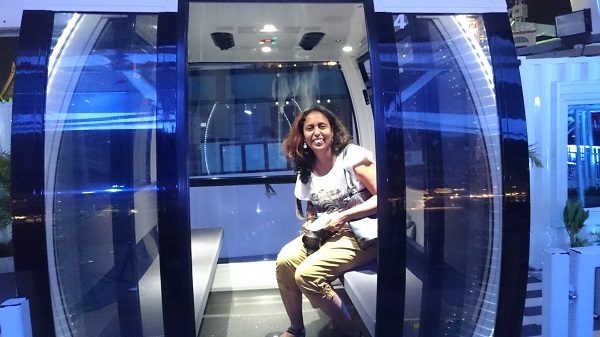 I was happy to see the night lights of Bangkok from the sky wheel. I was also happy to photograph Songkran Festival from the safety of my car! 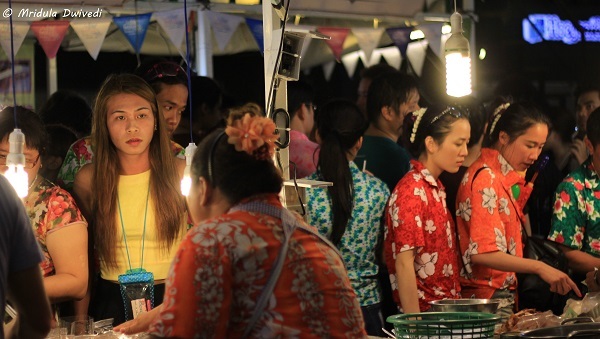 If you like to click street pictures you will find Asiatique a happy place. Everyone clicks pictures so no one will take any particular notice if you too took out your camera! 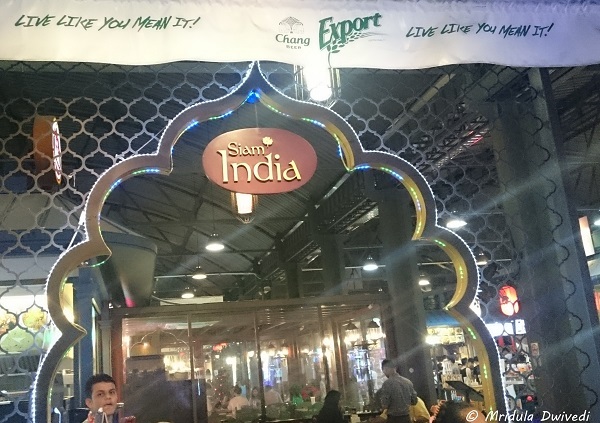 If you are craving for Indian food there are Indian restaurants within The Asiatique. There are regular big fast food chains present as well. 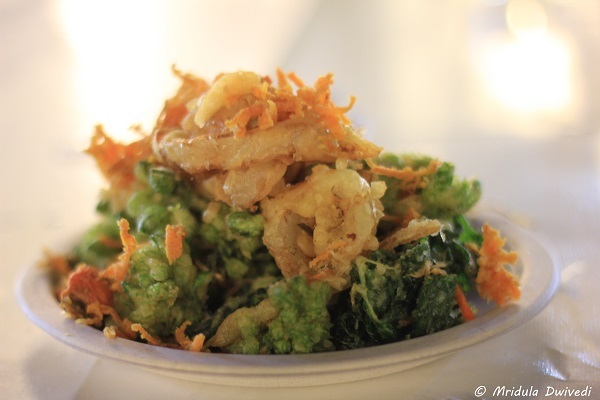 When I visited, there was a street food festival going on and I tried that for my dinner on both the nights! There was a stall devoted entirely to vegetable fries and that was an obvious choice for me. It tasted good as well. 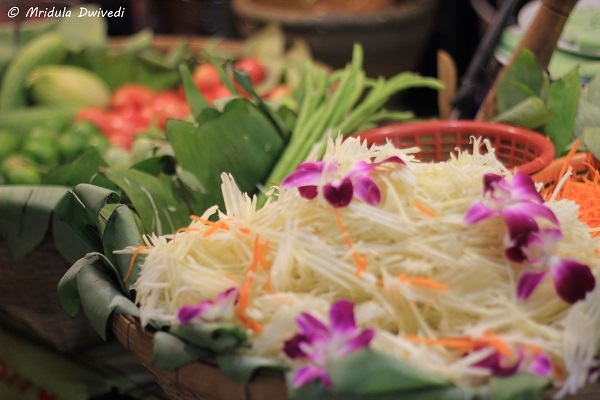 Green Papaya Salad can be another option for vegetarians. I would just tell the vendors not to use anything related to fish in my portion. 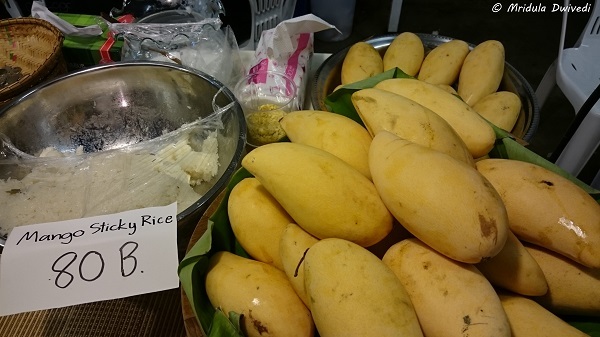 And if everything else fails, there is always mango sticky rice! I ate it after the fries. On the second night I ate noodles where I told the lady not to add any fish or meat to it. She was happy to prepare one for me only with vegetables. And then I followed it up with mango sticky rice again! If you can eat eggs you will have even more choice! 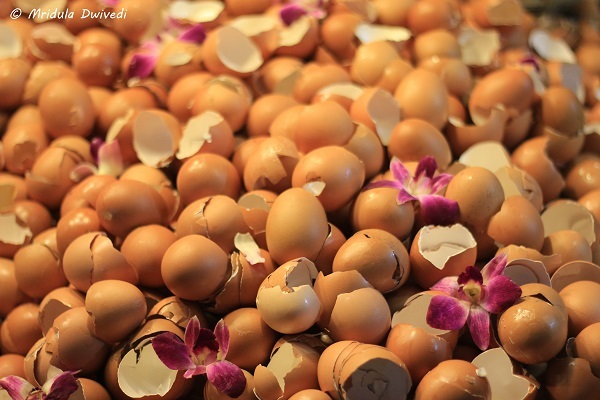 A vendor used the discarded egg shells as a decoration for his stall as he would go about making the egg dishes. The street food stalls were doing brisk business! I was happy to stroll around and click pictures! The more organized side of Asiatique has a lot of shopping but I didn’t buy anything from there. At the entrance there were some street musicians playing beautifully. 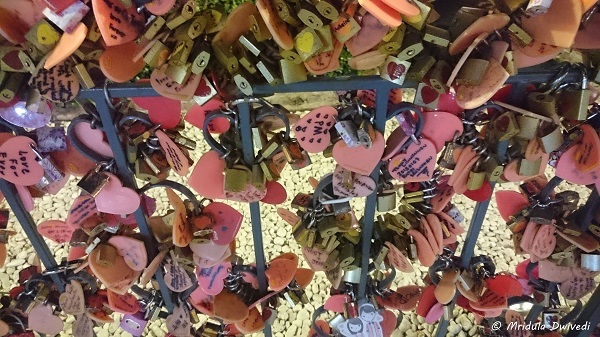 At one point I found this curious place where people placed their love locks! 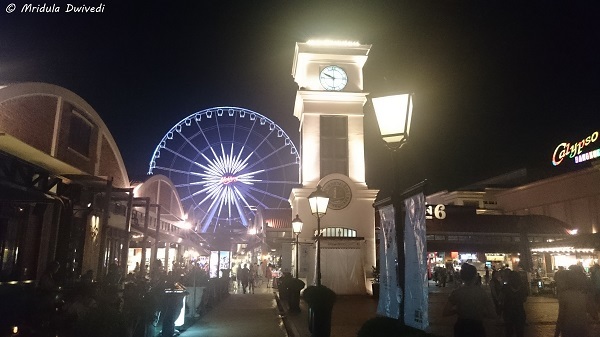 I enjoyed myself thoroughly on both the nights I went to Asiatique. I anyway love walking. It was also a lot of fun because I could walk back to my hotel Ramada Plaza from Asiatique! PS. 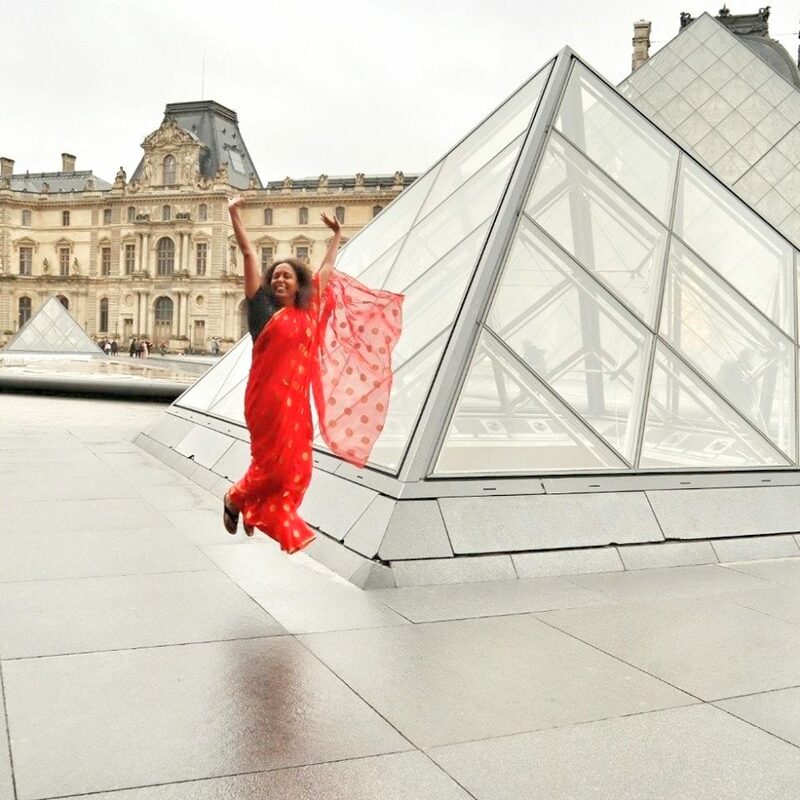 I was invited on this trip by TAT New Delhi!